So I've just started downloading the 1GB or so to upgrade from Dapper Drake to Edgy Eft. This is not automatic - but it makes sense as users should stick with the Long Term Support releases unless they know what they are doing (though an advanced GUI element would be nice). Will report back on success/failure. Worked pretty much fine. Had to do at least one extra upgrade after it had finished to get everything updated, however this was shown by the automatic updater tool so normal users shouldn't have a major problem. Firefox 2 is nice. Now uses the standard icon (Ubuntu decided they could live with that unlike Debian?). Movies work out of the box so can browse Apple.com trailers etc. It has crashed once on me so far (but new crash catcher seems nice). Hopefully Edgy will pick up the flash 9 plugin when it is formally released. Startup screens etc seem more colourful and cleaner - a bonus for Joe User. The startup actually seemed slower, but that could just be because there is no boot text now. I must check if escape shows it as it can be very useful. Aside from that haven't noticed any stand-out changes. I guess it's mostly just polish. I must try Rhythmbox/Banshee - I think they'll support my iPod now. Things like F-spot are formally supported (it uses Mono) so might start using that more. glChess - still not in the top 100! By the way I'm in Singapore on the way to Syndney - I have to unlearn all my British keyboard skills (of course my laptop will still be British). The next Ubuntu release has a simple but handy-looking new tool. Due to all user-owned files being in one directory in Unix (which I think is a great strength of the system), this tool will help Joe-user to safely back up just the files that count. When recommending people upgrade (for instance my dad) I always worry how to tell them how to back up. This will give some piece of mind. I updated my system today and this bug has finally been fixed. This bug has been around for approximately 6 months and even though the cause was identified (in the way translation files were being generated) early it took a ridiculous amount of time to be fixed. I really wonder why a bug of this severity (caused dd (at least) to segmentation fault) in a distribution marked as Long Term Support that was repeatedly reported from many users was not put to a higher priority. I hope there is a central bug triaging group in Ubuntu that lists and works to diagnose and fix the top 10 bugs. Made a new release because some users were hitting an exception when stock icons couldn't be found. If the icons aren't there now I just don't display them. Bonus new features: new/updated translations and support for UCI chess engines. I had always considered that Linux distributions were disadvantaged compared the commercial OSs because of the software installation procedures. Use case: a user finds some application on a web page they want to try. When the try to install they have to worry about multiple distributions, multiple versions, root access required... My first impression is bye-bye user. I've been cleaning spyware off a number of peoples PCs recently and have come to realise that for low-tech users this is in fact a big advantage. By being able to pick software from a distribution provided list these users cannot install malicious software. Talking with a middle-aged couple showed there were key applications they wanted (e.g. Google Earth) and they installed other things (some of which were spyware) but wouldn't have been upset if they couldn't. They were used to Windows running slowly (due to the spyware) which meant they were used to a poorly performing computer. I expect this sort of user makes up a large population and would have a positive experience using Linux. The current distributions only provide a subset of available software. To provide access to the long tail of available software a user-rating/validating system is required. Idea: When a user downloads a file from the Internet the file is checked against a distribution provided list (using URI or hash etc). If the file is not on a white-list they get the option to install anyway and inform the distribution that they have installed. In this way the distribution knows what is being installed allowing a) files to be blacklisted and affected users to be informed and b) the distribution to know which packages they should include in the distribution repository. This of course has some privacy issues but most users can trust their distribution and always include an opt-out option. Note there is a packaging format called Zero Install that if adopted would make installing simple. Another fullscreen GPL chess client. Looks like this one is aiming for animation (i.e. Battle Chess). Compiles and runs well on my system. So I have gone through two glChess releases since the last release. 0.9.10 fixes a bug where upgrading users would hit a configuration exception. 0.9.11 is basically a big pile of polish. I've made 3D and Python imaging support optional which should make the user experience a lot better (at least it should half work on difficult systems). Lots of UI, theme and GUI integration changes too. Oh and glChess has been accepted for inclusion in Gnome Games! I guess I really am fulfilling my goals from my first post. Yay! Dreamchess - another GPL 3D chess engine. As with most 3D clients I have seen it appears to be targeted at full screen users. For 1.0 I think glChess should have a new name... It has been suggested to use a generic chess name like "Checkmate". The problem with this is generally these names have already been used. I think it's important for a project to have a name that stands out and it doesn't have to relate to the project (see Mesa). So I was thinking perhaps "Looking-glass Chess". For those familiar with Lewis Carroll will get the reference. It feels a little bit of a mouthful, what do others think? From a user-perspective this would only be in the about dialog and on the webpage. 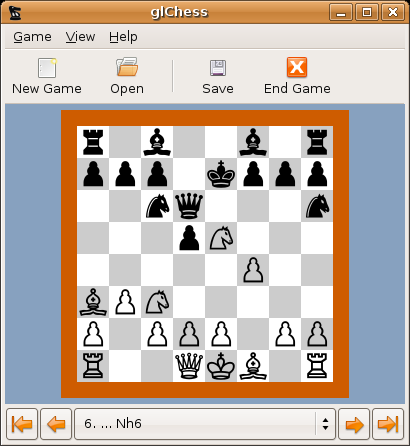 All menu references and window titles would just be "Chess" as Gnome started doing from 2.?. The binary has a character inversion from glchess to lgchess. You can switch between 2D and 3D using the menu. Unfortunately the app still depends on OpenGL but in the next release it will disable the 3D option if OpenGL isn't present. These optional dependencies are going to create a testing issue - the plan is once 1.0 is present only make 1.0.x releases after a lot of testing using VMware player. More frequent but less tested releases will be released using 1.1.x. This release also fixes a number of regression bugs. I have removed another accidental DBUS dependency and fixed the broken game saving. There are a number of changes to help in reporting bugs - the text output contains more useful information. The autosave feature should also work after exceptions are encountered.